As I've written here before, I'm a sucker for the "doomed space expedition"-style story featured in horror/sci-fi films like Alien (1979) or depicted on TV series such as Space:1999 ("Dragon's Domain,") Dr. Who ("Planet of Evil") and The Twilight Zone ("Death Ship"). I harbor endless fascination with these tales about courageous astronauts who brave dangers alien and eerie in remote corners of the universe; cut off from Earth; cut off from help. It's just a thing with me, I suppose...a frontier spirit maybe; or perhaps just a deeply-held belief that the next hill is always worth climbing, whatever the danger lurking on the other side. That danger doesn't have to be a monster in these macabre stories, just something unknown...and perhaps inexplicable. Like the planet in Solaris (1973), for instance. 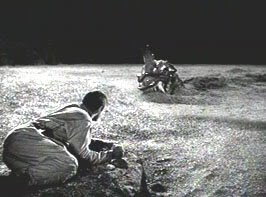 And that brings us to one of my favorite TV examples of the form; one that does feature a (very memorable) monster: an Outer Limits episode (from the second season) titled "The Invisible Enemy." Appropriately enough, the episode (written by Jerry Sohl and directed by Byron Haskin) first aired on Halloween in 1964, and it's guaranteed -- even today -- to give you a little shiver. The Control Voice (our series narrator) describes this tale as a "painful step from the crib of destiny" and "part of the saga of the space pioneers." More specifically, the episode involves a rocket, called M2 that lands on the chalky surface of Mars to investigate the disappearance, three years earlier, of the first mission to the Red Planet by the M1. Even with this edict in place, a subordinate, Mr. Lazzari suddenly disappears on the crumbly planet surface. Lazzari's fate may also prove amusing to Star Trek fans since he is played by Peter Marko -- doomed Mr. Gaetano in the Trek episode "The Galileo 7." Then another astronaut, Frank Johnson, also disappears...in an impossibly fast fashion. Merritt discovers the subterranean sharks while trapped atop a rock in the middle of the "ocean" (see picture above), even as a sand storm blows the tide higher and higher. It is at this moment -- with man and beast in the same shot -- that the audience realizes for the first time how colossal the sand shark is. One step into the sand, and Merritt will meet the same grim fate as his crew members. In the end, the surviving Earth men escape the hungry sand sharks and return safely to Earth. The episode makes a big point of the fact that the astronauts both survive, in large part, because they willfully ignored Ground Control (and Telly...) and made "human" decisions in the heat of the moment instead. Again...it's a kind of pioneer spirit. Free from bureaucracy and committee; with life or death on the line. One reason I enjoy "The Invisible Enemy" so much (besides my fetish with 1960s future-tech...) is the exquisite, black-and-white visualization of the Martian landscape. Though scientifically inaccurate -- there's air on Mars!? --- the terrain is nonetheless foreboding, barren...and gorgeous. Rocky outcroppings dot the horizon, and the endless sand ocean glimmers and brims with mystery. In one evocative shot (from Buckley's perspective), the sandy sea actually transforms into an Earth-style, watery sea, and that's how the astronaut begins to suspect the existence of, well, sea life. But the image I've always remembered most from this episode involves the monster itself: the roaring, hungry sea shark. We first see an ugly dorsal spine cut above the sand, like a shark fin cutting over a watery-surface. And then, over time, more of the beast is revealed until we understand it to be some sort of huge, malevolent, gliding under-sand dragon. One of the episode's final shots is a humdinger too: a whole school of the beasts -- six or seven, perhaps -- breaking the surface after their brethren is killed...with vulnerable man just outside reach, on the rocky shore beyond. "The Invisible Enemy" also reminds me of a (buried) fear of mine from childhood (no doubt brought on by my exposure to Blood Beach ): the idea of disappearing beneath the sand on the beach, grabbed and eaten by something invisible and avaricious. When we do get to Mars, there likely won't be giant sand sharks waiting for us in dusty seas, but there will, no doubt, be other Invisible Enemies. Perhaps just the elements themselves. 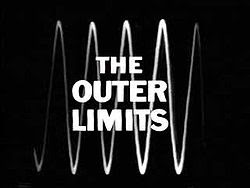 Hopefully we'll meet those challenges with the same insight and resourcefulness demonstrated by Merritt and Buckley in this classic Outer Limits episode.